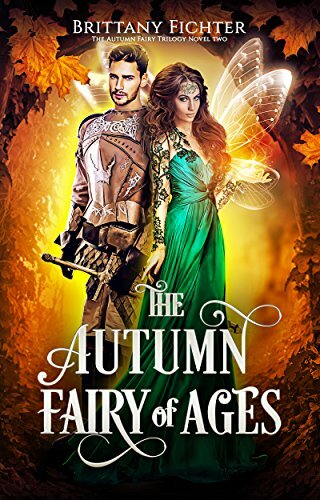 The Autumn Fairy of Ages is the sequel to The Autumn Fairy by Brittany Fichter. It's pretty similar to the first book aside from a new setting. Where The Autumn Fairy took place in the human world where Katy was raised and fell in love with her childhood friend, Peter, The Autumn Fairy of Ages takes place in the enchanted world of the fae where Katy hopes to find her new home. I appreciated that the book contained a brief in-universe explanation of why the spelling of the word "faeries" was changed to "fairies" in most contemporary prose even though it was derived from the word "fae" because "humans have trouble pronouncing it." For the most part, I would say that anyone who enjoyed the first book will probably enjoy this one as well. It introduced a lot of new characters, but not a whole lot has changed for the ones we know. Katy and Peter are still fighting against societal norms to prove their love for each other, and Katy still feels like an outcast because of the unusual circumstances of her birth. One thing I've noticed about Brittany Fichter's writing is that she creates complex new worlds full of unique customs and language without ever explaining any of them to the reader. I was hoping that a book about a new world that was so foreign to both of the main characters would contain more lessons about how fae culture works, but instead, Katy and Peter struggled just as much to understand all of it as I did and even broke several rules without even realizing it. There were certain things that I never quite understood about Peter's role in the fae realm. He was described as a "rhin," which is apparently a king, and was supposed to have a seat on the council with several other rhins and kneel before a magical tree that would help the fae maintain their islands even though the rhins were human Conversely, I completely understood Katy's role among the fae as the first Autumn fairy in centuries because they needed fairies from all four seasons to complete their rituals and save their land. When Katy mentioned that she wanted to do a good job to make Peter look good, the logistics became kind of muddled. Even some of the other fairies admitted that the council didn't care at all about Peter and only wanted Katy for her unique powers. For the most part, Katy and Peter's relationship stayed as strong as ever after the events of the first book, but they were still tested. The only thing that even came close to pulling them apart was the question of whether or not they would be able to procreate due to one of them being a fairy. I personally could not relate to this struggle because I don't think the ability to bear children should affect who can fall in love with each other, but I understand that Brittany Fichter is religious and incorporates that into her writing, so it didn't come as too much of a surprise that it would be a challenge for the main characters. I also understood why the fairy council was against their marriage in favor of the potential of creating more Autumn fairies, but I didn't think that it should have made Katy and Peter doubt their love for each other. Peter did go overboard with his affections a few times at the beginning of the book by trying to please Katy at the expense of their good image for the council, but that was only a testament to how much more he valued love over power even though it made him seem less than worthy of his role. My favorite aspect of The Autumn Fairy of Ages was the setting. Katy and Peter were both given beautiful rooms that magically incorporated elements of nature such as flowers, trees, sand, waterfalls, and the ocean. The descriptions reminded me of something straight out of one of the Barbie movies. Fairy fashion also matched that of what we would traditionally imagine for fairy clothing, such as short skirts made of petals or tree bark, leafy corsets, and gowns covered in blossoms. I wish the book had more descriptions of the setting because I love dreaming about other worlds. The surprise ending also impressed me. I can't believe I never saw it coming. It made sense to end with something shocking because the series is supposed to be a trilogy, so it was necessary to build up tot eh final book. Of all the characters who could have been hiding a secret, this one was the most likely. It was brilliantly developed throughout the novel so the reader would gasp when they reached the ending and wonder why they didn't realize it sooner. The Autumn Fairy of Ages is a worthy sequel to The Autumn Fairy. It's an obvious next step for Katy's journey. Since we already explored Katy's experience in the human world, it would only make sense that we should be able to see how she would fare in the fairy world that she was born into as well. Her relationship with Peter was texted again and still remained strong. Though I enjoyed the descriptions of fae culture, there were certain aspects that I wished the author had elaborated on. It was difficult to just jump into a new world without knowing anything. My pre-order of the book was filled with typographical errors, but the author sent me a proofread copy free of charge when she realized that her editor had jumped the gun. Overall, I would say that anyone who enjoyed The Autumn Fairy would enjoy reading about the next part of Katy's journey just as much.